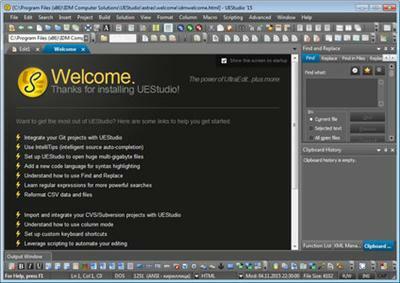 UEStudio includes all the features of UltraEdit plus native support for over 30 popular compilers (including Microsoft Visual C++, Java, GNU C/C++, PHP, Perl and over 30 others), an integrated debugger, integrated VCS version control, built-in class browsing, language intelligence (like Intellisense), project converter, and a batch builderR30; to name just a few of its advanced features. A significant element of a powerful IDE is a programmer’s editor or code editor. It serves as the core foundation of any IDE. 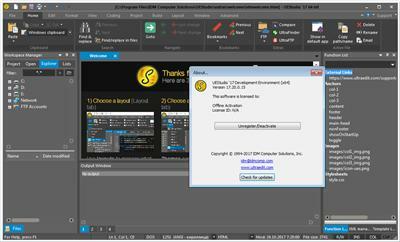 UEStudio is built on the chassis of the renowned UltraEdit. As such, the program’s backbone is highly seasoned, stable, and already proven as the defacto standard of text and programmer’s editors.